"Why is Preserving Agricultural Biodiversity Important? We are dependent on plants for everything from food to fiber and shelter. A vibrant, diverse plant world is necessary for our survival, but that world is increasingly threatened by climate change, habitat loss, and exploitation. The Millennium Seed Bank Partnership estimates that 60,000 to 100,000 plant species today are threatened with extinction. When a plant variety disappears, it's potential to aid us in the future is lost forever. The importance of institutions like Seed Savers Exchange is clear. Without deliberate efforts to save seed varieties before they disappear, the global community may be vulnerable to calamity." 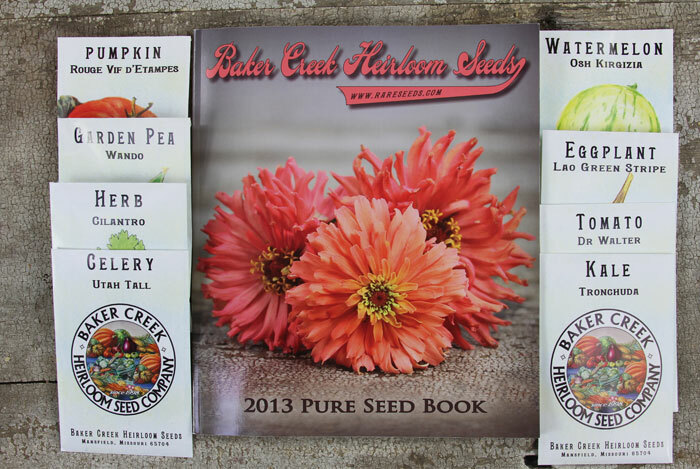 "An open-pollinated (OP) variety is one that breeds true from seed, meaning the seed saved from the parent plant will grow offspring with the same characteristics. OP seed is produced by allowing a natural flow of pollen between plants of the same variety." "Heirloom varieties are OP varieties with a long history of being cultivated and saved within a family or group. They have evolved by natural or human selection over time." "A hybrid variety does not breed true from seed; hybrid seed is produced by crossing two different parent varieties of the same species. Hybrids do not remain true in generations after the initial cross and cannot be saved from generation to generation unchanged." "Genetic modification is the direct human manipulation of an organism's genetic make-up, resulting in genetically modified organisms, or GMOs. Sometimes, genetic modification is done by manipulating the sequence of genes within an organism's genome. However, many GMOs are transgenic, or manipulated to contain a gene from another species altogether." From Wikipedia: "Genetically modified foods (GM foods, or biotech foods) are foods derived from genetically modified organisms (GMOs), specifically, genetically modified crops. 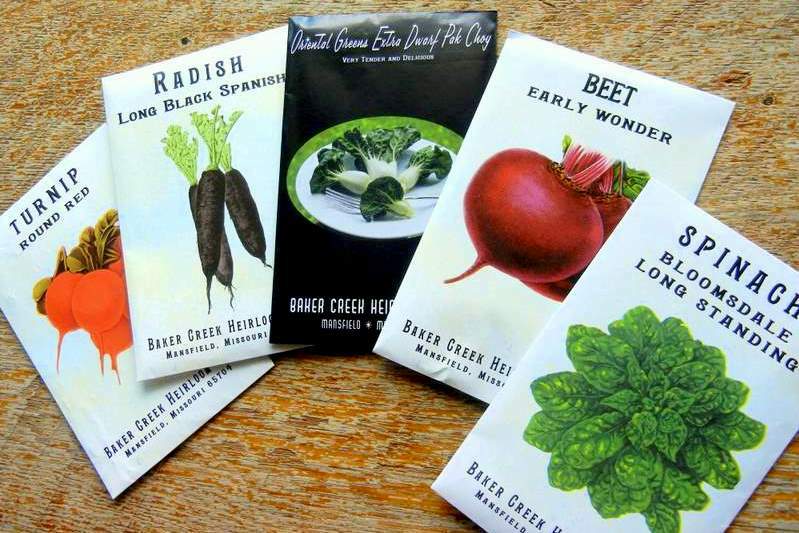 GMOs have had specific changes introduced into their DNA by genetic engineering techniques..."
If you know of any other good heirloom seed catalogs, let us know in the comments below. 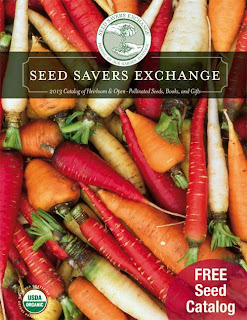 I'm preparing an order to send into Seed Savers myself. Something to keep in mind when planting heirloom seeds and planning to save the seeds is, if you want to keep the seeds pure, unaltered in any way, you have to be aware of other certain plants close by that can cross-pollinate with them, if they are a kind of plant that tends to cross-polinate with others; so you will want to do a search and read up on that. "After collecting them from the garden (from herbs, vegetables and flowers), dry them at room temperature on racks or on large sheets of paper for about a week to ensure they hold no moisture. After drying, separate them from their pods or flower heads by shaking them into large paper bags. 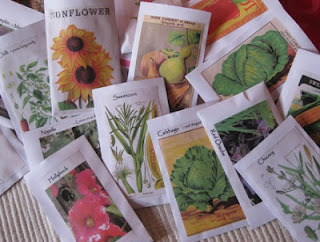 Sift out the dried plant bits then pour seeds into recycled paper envelopes or print off some paper packets. Mark on the packets the type of plant and the date they were harvested. Next take a Kleenex tissue and pour about 1 tablespoon of powdered dry milk in the center, fold the tissue up so you have a little packet, place this in the bottom of a clean glass jar. The powdered milk will act as a desiccant inside the jar and help to absorb moisture and help provide a dry environment. Next fill the jar with your packets and seal the jar shut. Keep the jar in a cool dark place to keep the seeds dormant, the back of the refrigerator is an ideal location." 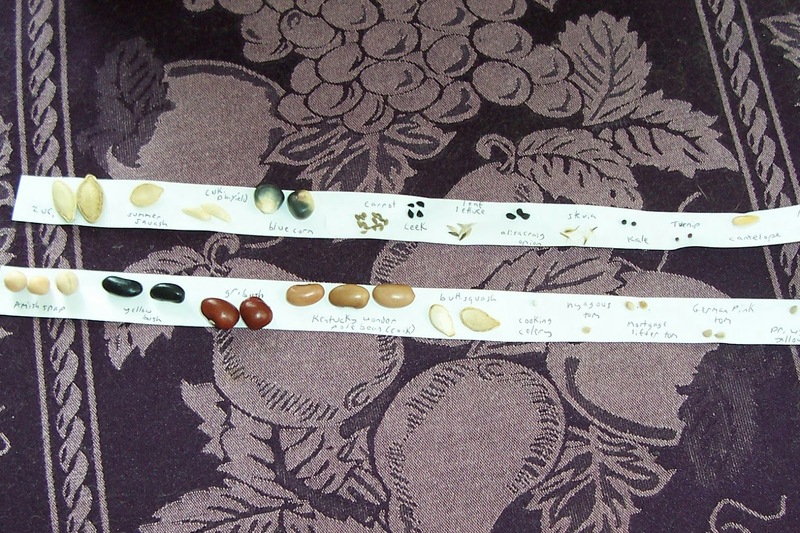 Seed Saving How-To1. Cut the fruit or vegetable open and extract the seeds. 2. Place the seeds in a colander and rinse with warm water. Blot the seeds with a paper towel. Lay the seeds out on a paper plate labeled with the variety name. 3. Allow the seeds to dry at room temperature in a well-ventilated place, keeping them out of direct sunlight for up to three weeks. 4. Once the seeds have dried, place them in a glassine envelope. 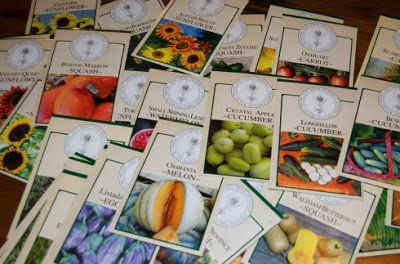 Download and print the seed label template with a photo label of your fruit or vegetable before it was cut up, and attach to glassine envelope with double-sided tape. 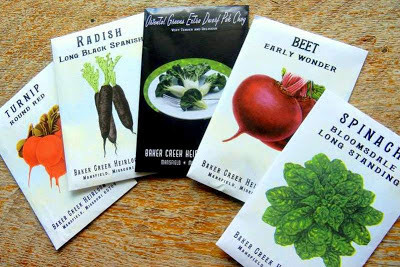 If kept in an air-tight container and placed in the refrigerator, these seeds will be good for at least six years. "Wash your heirloom tomatoes, then cut it in half across the middle (not the stem end). Gently squeeze tomato seeds and juice into a labeled glass or plastic container. Fill containers about half full, then set them out of direct sun in an area where you won't be bothered by the ripening odor or fruit flies. Allow the seed mixture to sit until the surface is partially covered with whitish mold (in three to five days). In warm climates, you may need to add a little water midway through the process to keep the seeds afloat. Scrape off the white mold with a spoon, being careful not to remove seeds. Fill the container with water, then stir; the good seeds will sink to the bottom. Pour off and discard floating seeds and pulp. Repeat until the good seeds are clean. Pour the cleaned seeds into a fine strainer; rinse and drain. Sprinkle seeds onto a plate and allow them to dry for one to three days, depending on the weather. Keep them out of direct sun. To make sure they dry thoroughly and don't stick together, stir twice a day. 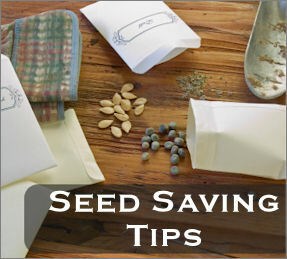 Store dried seeds in a cool, dry, dark place in individually labeled airtight containers such as glass canning or baby food jars until planting time next spring." Here is a list of how long seeds can be expected to last in "well-stored" conditions from growingtaste.com. Update: I thought it might be a nice idea to put a couple seeds of different kinds in my bug out bag as an extra little stash. I wanted to still label them but not have to use little bags or something for just a couple of a lot of different kinds of seeds. Then, I remembered seeing a tip on Pinterest how you can make seed strips for planting using newspaper strips and Elmer's glue, so I used that idea. :) You can still write what they are on the strips. I'll roll them up and put them in a little bag. Just rip it into sections when you want to use them and plant them with the paper. Heirloom seed is more advantage for human being. I need the features of hybrid & non hybrid seeds with most advantages so please suggest me. If you want to take the benefits over heirloom seeds for sale then go through it. The uses and the positive vibes of a seed banks and its future aspects are discussed in this passage. The topics related to seeds heirloom are covered here. The seed vault is what borrow an offer or help to create a start or a starting point. Some sort of survival seed bank kit, it would be for all time wished-for that you receive always so that there is no shortage. The Best seed bank is the one which will have a great collection of seeds and will also help the preservation of knowledge of cultivation in different kinds of soil. The Survival seed bank would be a very good step towards that direction. 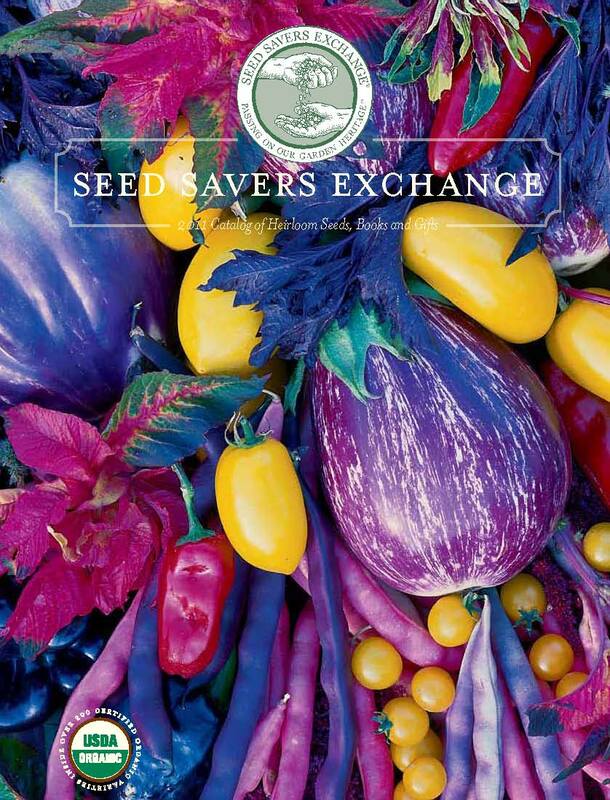 Without saving the seeds using the Best seedbank, there will be no seeds left after a natural catastrophe. The point is that people may not have much of an alternative than Emergency seed bank.